By Philip Riley. Extensive research into the great un-made WAR EAGLES film that was to be a great follow-up to Willis O'Brien's KING KONG glory. Dinosaurs and giant eagles that are ridden by humans. Production stills, frames from shot sequences, the script, Ray Harryhausen interview, MUCH more! 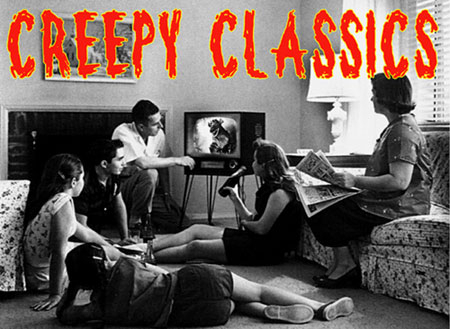 Trivia quiz's to test your skill and knowledge of classic horror and science fiction films. Lots of trivia, questions and quizes with loads of photos from movies like FROM HELL IT CAME, THE KILLER SHREWS, CREATURE FROM THE BLACK LAGOON and scores more! 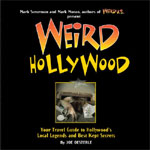 “Movie Capital of the World,” Hollywood is chock-full of offbeat characters, peculiar activities, and strange sightings. With California resident and humorist Joe Oesterle as your guide, meander through bizarre back alleys and darkened theaters. Creepy weirdness. Packed with color photos. Giant hardcover with beautifully reproduced horror comics from Eerie Publications and their history from the 1960s-1970s. These magazines brought blood and bad taste to America's newsstands from 1965 through 1975. Discover Myron Fass, the gun-toting megalomaniac publisher and more! A man returns from space...but ther's something wrong...an alien monster is inside him and he could transform at any moment! A 1968 paperback. The continuing story of Sherlock Holmes and Dr. John Watson. "Edited" by Nicholas Meyer. A wonderful continuation of Holmes in the style of Sir Arthur Conan Doyle. Hardback book with dust jacket. Very good condition, ex-library with standard library markings. Stunning. A giant, oversize hardback book...all heavy stock, glossy pages and in vivid color. Sharp, crisp reproductions of all the classic monster and horror posters from the 1920-1950s. A giant collector piece and MUST HAVE book by premiere collector Jim Gresham. 320 pages. The classic novel by Philip Wylie and Edwin Balmer. 1975 Warner Paperback Library edition. Very good condition, woman's name in red pen on inside. Book published by Hershenson Press on movie posters of the 1950s...all horror and sci-fi! Glossy heavy stock paper with reproductions from THE GIANT BEHEMOTH, TARANTULA, THEM, INVASION OF THE BODY SNATCHERS, KILLER SHREWS, REVENGE OF THE CREATURE and scores more! Full color. By Greg. Mank. They had more in common than just a scream, whether they faced Dracula, Frankenstein, Wolf Man, or any of the other legendary Hollywood monsters. Their contributions to the films and folklore. CLICK IMAGE FOR DETAILS. A hardback companion book to the movie from 1962. Background on the brothers, the movie, actors...lots of color photos. Thin hardback that is about 8 1/2 X 11. A really great collectible book. Great photos of George Pal's special effects too.